Translations copyrighted 1980 to Heyne. "Printed in Germany 1980" stated on copyright page. However, Heyne bibliographies (such as this) list 1981 as year of publication. 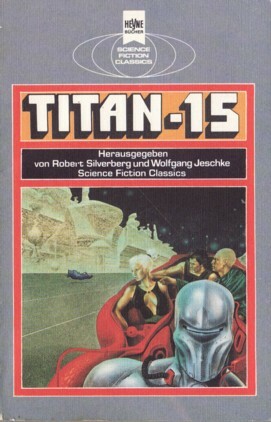 It's 'Titan-15' on the cover, but 'Titan 15' on spine and title page. Tom Godwin's novelette is announced as Die unerbittlichen Gesetze in the table of contents (p. 5). Cover artist credited on copyright page ("Umschlagbild: Jim Burns/Young Artists").